The Tennessee Inventor's Association (TIA) meets the fourth Saturday of every month from 10:00 am until 12 noon at the Cedar Bluff campus of Lincoln Memorial University (LMU). The Cedar Bluff campus is at 421 Park 40 North Blvd., Knoxville, TN 37923. Google map of LMU. Enter the main entrance of LMU. The security guard will direct you to meeting room 154 (straight down the hall, past the snack area, and on the left). Everyone is invited to the meetings. Travel either Kingston Pk. or Parkside Dr. east to Cedar Bluff Rd. 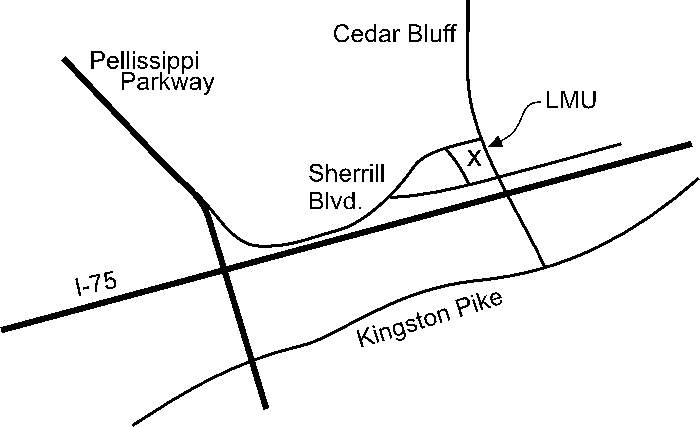 Turn left onto Cedar Bluff Rd. Travel approx. 1 mile to the traffic light at Sherrill Blvd. (Starbucks, Kentucky Fried Chicken & Burger King will be on your left). Turn left onto Sherrill Blvd. The next immediate left turns into the parking lot.